Booklet style opens on the top. Perfect for shipping and storing documents, photos, diplomas, artwork, maps or other flat items. Will not crush or bend. Peel and Seal closure. Easy and quick to seal. Tamper Resistant. Easy to open by pulling tear string on either side of the flap. 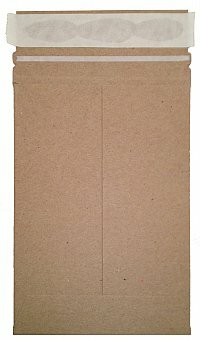 Brand new mailers made from 100% recycled material (85% post consumer waste). 100% recyclable. 7" x 9" - ON SALE! 11" x 13-1/2" - ON SALE! 12-3/4" x 15" - ON SALE! 17" x 21" - ON SALE!